Couscous/Kuskus is a form of Semolina granules made from durum wheat. It is slightly bigger than Rava (Sooji) which is used in Indian Cuisine. It is considered to be healthier than pasta. Couscous is sometimes known as the world’s smallest pasta. Traditionally, Couscous is steamed several times until it is soft and fluffy. Instant Couscous which is available in the supermarkets is pre-steamed and dried and can be cooked within 5 minutes. You can cook couscous in water or broth. 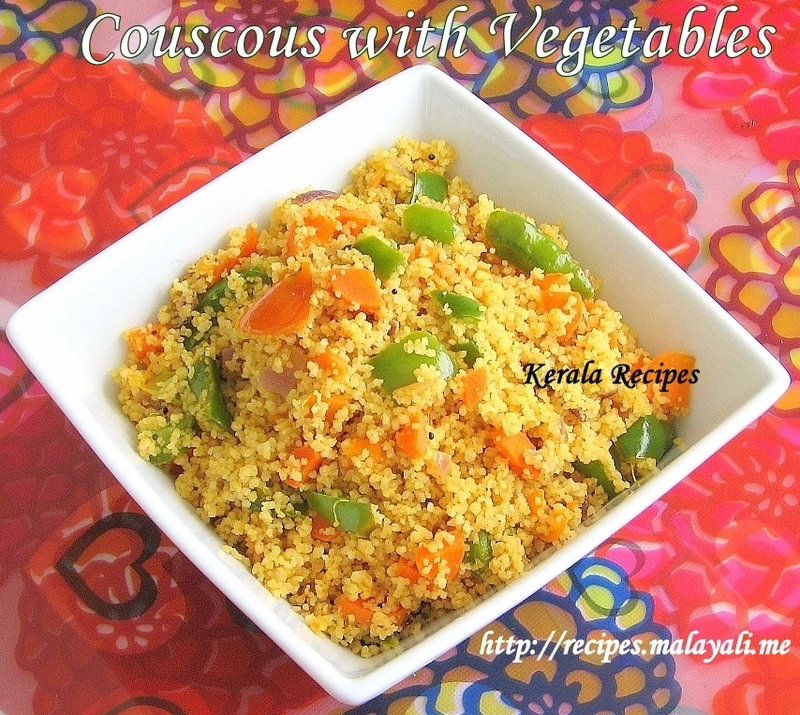 Here is a very simple recipe using Couscous and Vegetables. Couscous tastes good with Indian spices. Since Couscous is larger than Rava, you don’t have to worry about it becoming mushy. The grains tend to remain separate. Cook couscous according to the instructions on the packet. For 1 cup of Couscous, I used 1 and 1/4 cups of water. Bring lightly salted water to a boil in a saucepan. Add couscous, stirring quickly. Cover with a lid and remove from heat. Let it sit for 5 minutes and then fluff with a fork. Add tomatoes and slit green chillies along with salt and continue sauteing until the tomatoes are cooked. Throw in the carrots and stir fry for a few minutes. Add the bell peppers and cilantro leaves. Continue sauteing until the vegetables are cooked but crispy. Add the couscous and toss everything together and remove from stove top. Is it our indian sabudana ??? Sabudana is made out of tapioca whereas Couscous is made of wheat. It is a type of pasta.